.buzz domain names are about to get a lot more buzz. Howard Lefkowitz presented his plans for almost 400 .buzz domain names today during a NamesCon presentation. The majority of his domain names are city names, but also include travel.buzz. For two weeks starting February 2, particular .buzz domain names will be the prize sponsors for Wheel of Fortune, one of the most-watched TV shows in America. Lefkowitz also unveiled the .Buzz showgirl reviewers at NamesCon today. These showgirls have video cameras embedded in their headpieces and will do a number of reviews (presumably posted across .buzz websites). He is also sponsoring a section of the L.A. Times to promote Vegas.buzz. 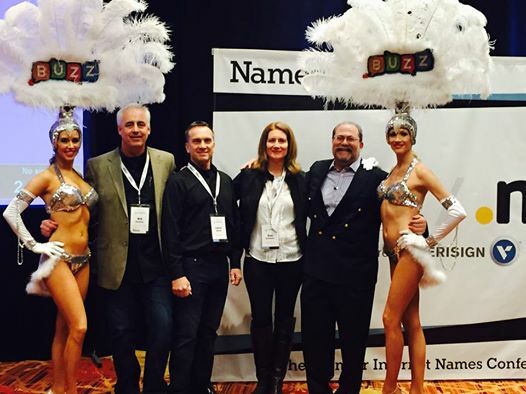 The.buzz team announces Wheel of Fortune event, and .buzz showgirl reviewers in Las Vegas at annual NamesCon conference.